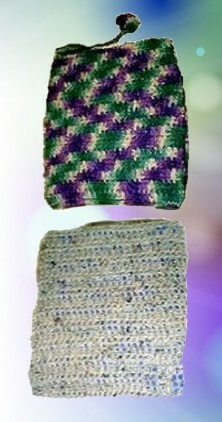 Choose one of two crocheted book covers – a simple crocheted book “sock” to protect any book that you slip inside, or a traditional book cover with flaps to hold the cover in place while you read, and a handy attached bookmark. Open the book, and make a chain a little longer than the book. In second chain from hook, single crochet, single crochet across. Turn, chain 1 single crochet across. Repeat until the width of the book. (Book closed, up and down) Fasten off. Now thread a needle with the elastic, with a knot in the end and go around the outer edge of the sox so that it has some gathering. Fasten off. This is the tan picture, (top left photo). Slip a book inside the “book sox” for gift giving or to protection. For the variegated book cover shown in the photo, make a chain the size of the open book. Single crochet as for the first book sox. After fastening off, fold in both sides, like a normal book cover and stitch the outer edges with yarn. On the top center of the book cover, join and make a chain, 3 double crochet in second ch from hook, ch 1, 3 double crochet in same chain, fasten off. This will be the book mark. Add a matching tassel or small pom-pom, if desired.